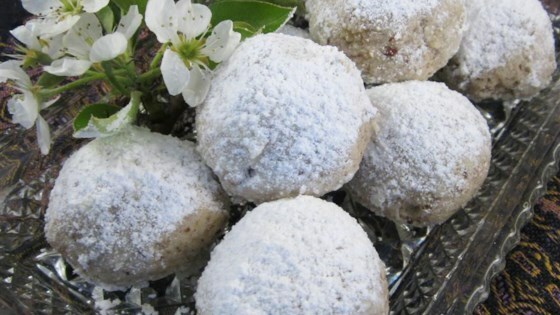 "These are similar to Russian Tea Cakes but use cake flour instead of regular. They literally melt in you mouth!!!" Preheat oven to 300 degrees F (150 degrees C). Grease cookie sheets. In a medium bowl, cream together butter and sugar until smooth. Beat in the vanilla. Grind pecans in a food processor or blender; toss with cake flour. Stir the pecan mixture into the creamed mixture until well blended. Roll the dough into tablespoon balls, then place them 1 inch apart onto the prepared cookie sheets. Bake for 25 to 20 minutes in the preheated oven, or until lightly browned. Roll warm cookies in confectioners' sugar. When they are cooled, roll them again. These came out as I remember them from growing up. I think they need to be a bit sweeter though. WOW!!! This is the recipe I have been searching for every holiday season. I did not change a thing about the recipe and they really did melt in your mouth!! Thanks for the WONDERFUL recipe! Same recipe from growing up, so yummy!